Those suffering the most from the great recession of 2009 were arguably young people. Many of those leaving school to enter the world of work saw their chances on the labour market dramatically reduced. From 2008 to 2013, the employment rate for the 15-24 age group dropped from 37.3% to 32.1%. Over the same period, the unemployment rate increased from 15.9% to reach the historical peak of 23.7% in 2013. However, neither the unemployment, nor the employment rate is a good reflection of the labour market problems that young people face. Indeed, many of them are not available for the labour market because they are in education or training. The attention of policy makers therefore shifted to the new concept of NEETs. NEET is an acronym that emerged from the UK in 1999 and was adopted worldwide to refer to young people 'Not in education, employment or training'. NEETs can be subdivided into those who are looking for a job (unemployed) and those who are not looking for a job (inactive). Young NEETS are seen as a particularly important group to focus on in a timely manner as there fears that this status could scar them for their entire working life with serious implications not only for the individuals concerned, but also for the future of our economy and society. 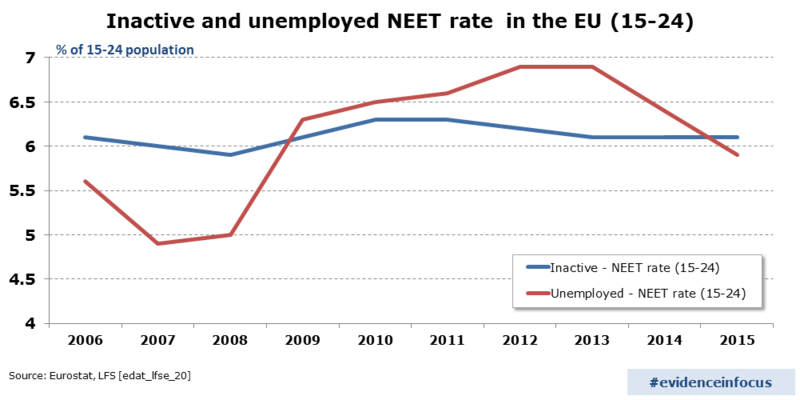 In the EU as a whole, NEET rates soared to 13.2 % in 2012 (see chart). Encouragingly, in 2015 the youth unemployment rate in the EU has come down to 20.3%, the employment rate increased to 33.1% and the NEET rate also has fallen to 12%. Those 'in education and training' have been on a steady increase, reaching 65.8% in 2015. These are promising developments. Nevertheless, the positive NEET developments do not appear to be shared by all the individuals in this group. At the EU level, it can be seen that the group of inactive NEETs hardly changes in size. This pattern can be observed in almost all Member States, with the share of inactive NEETs ranging from just under 3% in the Netherlands, to around 12% in Romania and Italy and 14.3% in Bulgaria. So while the effects of an improving economy – and possibly also more determined policy interventions for young people on the labour market – show good results for unemployed NEETs, the situation for inactive NEETs is much more protracted. Inactive NEETs are not a homogenous group as supported by the findings in the Eurofound report on NEETs. It shows that in Member States where NEET rates are particularly high, around 40% of these inactive youths are discouraged from looking for a job. These are Member States with very unfavourable labour market conditions. For Member States with more favourable situations, a different picture emerges. In fact, for quite a large portion of these young people there are a myriad of reasons why they remain far from the labour market, ranging from caring responsibilities to personal health challenges. However, a significant number of young people aged 15-24 who are not in employment, education and training and who are not even looking for work is a major policy challenge and deserves greater efforts to understand, and remove, the obstacles that bar them from the labour market. Author: S. Jemmotte is a socio-economic analyst in the Thematic Analysis unit of DG EMPL.